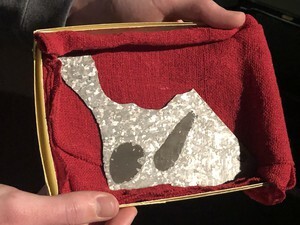 A piece of the sacred meteorite of Tomanowos, also known as the Willamette meteorite. It was returned to the Confederated Tribes of the Grand Round as a donation by the Evergreen Aviation and Space Museum. Aviation & Space Museum in McMinnville returned to the Confederated Tribes of Grand Round. Cheryle A. Kennedy, Grand Ronde tribal chairwoman, says she felt overwhelmed by the event. "The representation of a piece of meteorite being brought back to people is also representative of us that healing is occurring with us. That is all the parts are returned, and we can come home as well. ”Tomanowos is over 30,000 lbs, making it the largest meteorite found in North America and the sixth largest in the world. Comprised of iron and nickel, scientists think it may have formed when a long-gone planet shattered. Because of its large size and distinctive shape, it's becoming one of the best-known meteorites in the world. But long before Tomanowos was donated to the American Museum of Natural History. Willamette Valley, whose descendants are members of the tribes of the Grand Round. The Clackamus knew that Tomanowos came from the sky, and used the water that was collected in its divisions and basins for cleansing and healing. The Confederated Tribes of Grand Ronde make a yearly visit to Tomanowos, where they hold a private ceremony at the museum. "We express our appreciation from the standpoint that they are keeping something which is very sacred to us," says Kennedy. The museum's interim executive director indicated in a prepared statement that the meteorite's sacred nature for the Grand Round was an important factor in the decision to return it. "It is a great honor for the Evergreen Aviation & Space Museum to return this culturally significant artifact to the Grand Ronde Tribe, so they may share it with generations to come," Interim Executive Director John Rasmussen said. This is the second piece of the meteorite to be donated to the Grand Ronde, and there are thought to be about a hundred of pieces of the meteorite owned by private collectors across the country. Kennedy hopes there will be more returned. "I think when folks hear the story, they will come back and donate their pieces back," Kennedy says. "Recognizing that as all of the meteorite is returned, it helps make a people whole."